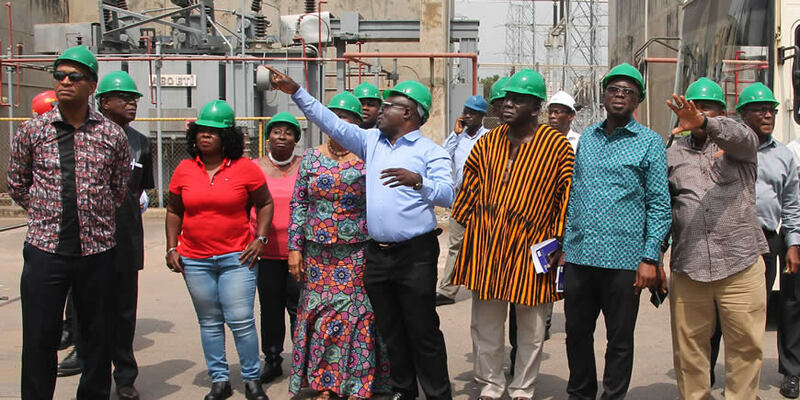 The Eight-Member Board of the Volta River Authority (VRA) have undertaken a tour of the Authority’s operational areas with the aim of familiarizing themselves with the operations and more importantly, to understand and appreciate the inherent challenges. Speaking to the VRA NEWS, the Board Chairman, Mr. Kweku Andoh Awotwi, disclosed that the tour was important as it afforded members the opportunity to understand how VRA's thermal and hydro generation systems worked as well as enabled them to critically assess the operational challenges, particularly with the thermal system, prior to designing strategies to ensuring the repositioning of the Authority and making it more financially sustainable. The Board Chairman stated that "their visit to the Western Operational Area (WOA) at Aboadze was to afford them the opportunity to understand at first hand, why the Takoradi Thermal 1 Plant (T1) had been operating under half capacity for so long, identify and diagnose the issues relating to the defunct Takoradi Thermal 3 Plant (T3) Plant, and finally, to critically understand VRA's contractual obligations with AMERI". Briefing the Board, Plant Manager at the Takoradi Thermal Power Station (TTPS), Ing. Stephen Owusu, stated that financial difficulties in 2017 primarily accounted for the reason why the T1 Plant was operated at about half capacity throughout the year. He explained that it had been the expectation of Management that the Plant would operate above 80% Availability. However, following the unexpected shutdown of the "GE frame 9E" Gas Turbine (GT2) on January 9, 2017, the plant's capacity was reduced to about half (50%), as the Authority had no option than to operate on only one Gas Turbine, (GT1), together with the Steam Turbine, thereby reducing the Plant's capacity by about half. According to him, theshutdown lasted that long following the Authority’s inability to raise funds to pay for the Long-Term Service Agreement (LTSA) Service provider for maintenance works to be carried out on the Unit. On the T3 Plant, the Plant Manager reported to the Board that the Plant became defunct in February 2015 because of equipment failure Engine failure). He explained that two of the T3 "ORENDA" Gas Turbines, Units 4 and 1 (GT4 and 1), manufactured in Ukraine failed in June 2013, while VRA was operating them on liquid fuel. He stated that the remaining two Units; Units 2 and 3 were later commissioned in June 2014 to be run on Gas, while investigations were conducted into the failures of GT4 and 1. He added, "Units 2 and 3 also developed failures in February 2015 resulting in the total shut down of the Plant." Regarding the AMERI plant, Ing Stephen Owusu said, VRA’s role in AMERI’s operation, is to facilitate gas supply from the West Africa Gas Pipeline (WAGP) and Ghana Gas through existing interconnection facility to the AMERI Plant for their operations, as well as facilitate power evacuation from AMERI’s facility onto the Ghana Grid Company’s (GRIDCo’s) grid system. Responding to the information gathered from the Area, Mr. Awotwi said, "he is hopeful that his team will begin carving out strategies that will redirect the Authority's fortunes back to its days of business success." Board Member, Nana Kwabena Nketiah V, the Esikado Omanhene, on his part reiterated that they would deliberate on their findings and suggest ways of improving VRA’s operations without interference. He challenged the staff to as a matter of urgency use their expertise to form various Consultancy Units to vie for contracts outside the Authority. Dr. Joyce Rosalind Aryee, added that she was impressed by the high sense of responsibility, skills and expertise of the staff. She therefore urged them to continue working hard to ensure the nation enjoys continuous power supply for national development. It would be recalled that the Board sometime in the last year paid similar visits to the Kpong and Akosombo Generating Stations. At the Kpong Generating Station (KGS), the team inspected the work on the ongoing Kpong Generating Station Retrofit Project (KGSRP). They were informed that work on the project was progressing steadily and forecast to be completed in October 2019. Touching on the benefits of the KGSRP, the team was told that it would among others secure clean energy availability by extending the life span of the dam by 30 years as well as resolve the issues of non-availability of spares due to obsolete technology. Summarizing their impressions, Mr. Awotwi said, “the visit generally gives the Board of Directors a favourable impression of the Authority, adding that the area generally, is well kept and we are impressed”. Presentations on other departments including the Environment & Sustainable Development and Engineering Services Departments, as well as the VRA Academy were made to give the Board first-hand information on their operations.